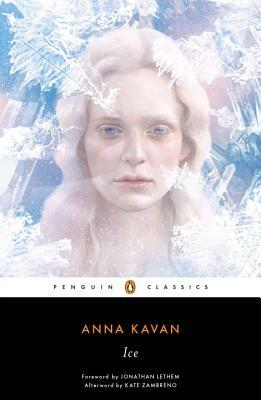 The 50th anniversary edition of Anna Kavan’s masterpiece of literary science fiction. The frozen disaster overtaking the planet in Ice evokes that Cold-War, bomb-dreading, postwar 20th century we still, in many ways, live inside; it echoes images as popular as episodes of Rod Serling’s The Twilight Zone or Kurt Vonnegut’s Cat’s Cradle. The presentation is scattered with scenes of war, civil unrest and collective societal dysfunction, both vivid and persuasive … Kavan’s commitment to subjectivity was absolute, but in this, her greatest novel, she manages it by disassociation … The book has the velocity of a thriller yet the causal slippages associated with high modernist writing like Beckett’s or Kafka’s. The whole presentation is dreamlike, yet even that surface is riven by dream sequences, and by anomalous ruptures in point-of-view and narrative momentum. The story of Ice is reported by a nameless narrator who claims to be a former soldier and explorer. We soon realize that he is entirely unreliable, and perhaps mentally unstable … The reason for the disorienting vagueness of so much of Ice becomes clear only in retrospect. It is a work of traumatized sexual surrealism, and its true setting is its author’s haunted imagination … The novel’s title refers not only to the environmental catastrophe of the encroaching walls of ice but also to the emotional numbness of the victimized girl whom the warden and the narrator are vying to possess. The abuse of the girl and the abuse of the environment stem from the same driving male impulse for control and dominance … A half century after its first appearance, Kavan’s fever dream of a novel is beginning to seem all too real. …[an] underrated masterpiece … The world Kavan builds is less a realistic 3-D model of a universe than what might be called ‘a field of strangeness,’ walled off not merely by the ice of the title, but by the concealment (and revelation, always the dance between the two) of the author. It is a work of ‘world-blocking’ rather than conventional ‘world-building’ … If Ice gathers to itself the properties of both a labyrinth and a mirror, the mirror is a clouded mirror — a glass in which we see, darkly, not ourselves, but shapes that may resemble us, outlines of a world that may be our world. Perhaps the best image for Ice is the funhouse mirror maze, where we are simultaneously lost and found, distorted and illuminated, blocked and blocked. What did you think of Ice?